Palestinian amora of the fourth generation (first half of the fourth century). He was his father's pupil (Ber. 77b; M. Ḳ. 20a) and the assistant lecturer ("amora") of R. Assi. If the latter asked him to repeat any of his father's sentences, if he himself had heard them from the lips of his father, he introduced them with the words: "So says my teacher in the name of my father"; but in other cases he said: "So says my teacher in the name of R. Eleazar." He transmitted also sentences in the name of his father (Yer. Yoma 39d) and of R. Hoshaiah (Oshaya) (Yer. Suk. 54d). Pedat was an intimate friend of Zera and Jeremiah ben Eleazar, who transmitted halakic sentences of his (Yer. Ned. 38a). Several of his haggadic interpretations have been preserved, including the following: "Deut. i. 17 does not indicate presumption on the part of Moses. On the contrary, he means to say: 'Bring difficult questions to me: I will decide them, if I can; if I can not, I will hear them and lay them before God for his decision'" (Midr. Shemuel, xiv.). He remarks, in connection with Gen. i. 2: "It is a law of nature that the air moves on the surface of the water, even when the sun is shining with its greatest heat" (Gen. R. ii.). 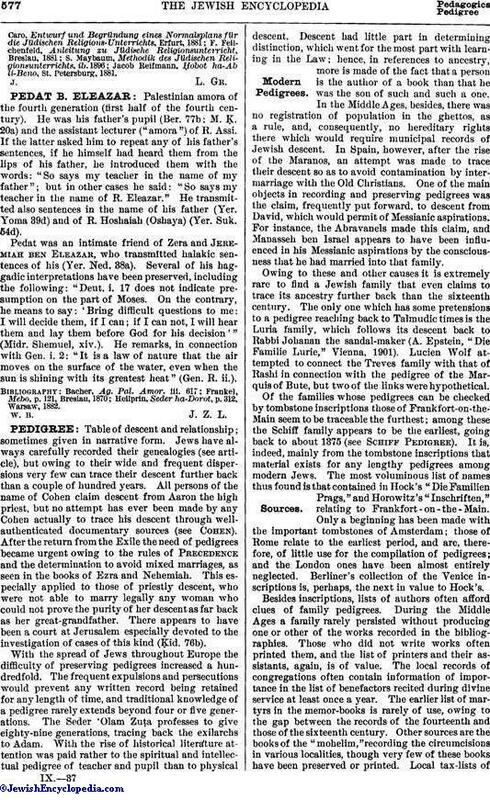 Heilprin, Seder ha-Dorot, p. 312, Warsaw, 1882.